The Bloodhound is powered by an EJ200 jet engine from a Eurofighter Typhoon fighter plane. 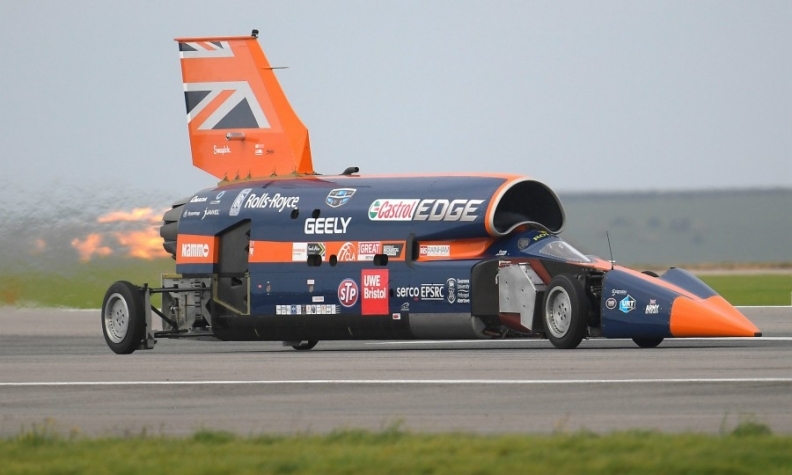 NEWQUAY, England -- The Bloodhound Supersonic Car, effectively a fighter jet on wheels, has begun its quest to enter the record books by eventually reaching a speed of 1,000 mph (1,610 kph). Before a crowd of spectators, the blue and orange, spacecraft-like vehicle with a high tail and long, rocket-shaped nose made two test runs down a 1.7-mile (2.7 km) track, reaching 200 mph (320 kph) in about nine seconds. It was the first public trial of the vehicle, powered by an EJ200 jet engine from a Eurofighter Typhoon fighter jet, ahead of a world record bid in South Africa in the next few years. Twenty years after setting the current world land speed record of 763 mph in the Bloodhound's predecessor, Andy Green, a British air force pilot, will aim to surpass his achievement. "We came here to say Bloodhound is Go! And that's exactly what we managed to demonstrate today," Green said after the test run in Newquay in the southwest of England. "The performance, the handling, the stability of it – I can't fault the car at all, it just worked brilliantly." The Bloodhound project was launched in 2008 in London with the objective of designing a car able to reach speeds of 1,000 mph. About 30 million pounds ($39.49 million) has been invested in the project thanks to support from the public and sponsors including Chinese auto group Geely and the Rolls-Royce aircraft engine manufacturer among others. The overall price tag could reach 60 million pounds. If the roughly 13-meter (39-foot)-long vehicle achieves its target 1,000 mph, that would surpass the low-altitude speed record for aircraft of 994 mph, according to the Bloodhound project website. At 1,000 mph, it would cover a distance equivalent to over four soccer pitches every second.